Mary's Peak at about 4,097' is the highest point in the Oregon Coast Range of mountains. It is near Corvallis, Oregon and is quite prominent, rising up from the valley floor of about 500' or so. It has clear vistas in all directions; it is possible to see the Pacific Ocean about 30 miles away, as far north as Mt. Rainier near Seattle and I've heard from some folks that on a really clear day, Mt. Shasta in northern California. Of course, most of Oregon's Cascade Mountains are readily visible. The access road takes you to within 3/4-mile of the top and from there it is an easy hike up to the top. I was fortunate because it was beautifully clear, no wind, and temps in the 60's to low 70's. The top is a grassy knob with ample room to set up a verticle antenna. I've seen pictures from the 50's and 60's when there was a Fire Lookout Tower here and the local hams would come up here for Field Day. That must have been a spectacular outing!! I was up here on a weekday so there were not many people which cut down on the curiosity discussions. I set up my vertical and began to have some QRP fun! I had to be back in the early evening for some family events otherwise I would have stayed well past nightfall. This is a great operating site, especially weekdays and of course when the weather is clear and the temps and winds cooperating. 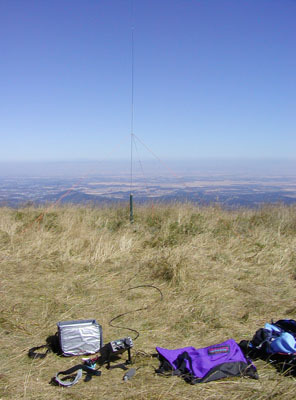 At 5,549' this is a spectacular site for both 360-deg vistas of the Cascade Mountains of Oregon, but a great QRP operating site. This Fire Lookout is located north of Oak Ridge and most of the road is paved then well graded gravel for the remainder. The directions can be obtuse and the signage not easy. It is best to get a copy of printed directions from the Forest Service office about 1 mile west of Oak Ridge proper. 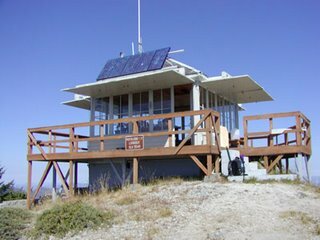 If the tower is manned, the gate will be open to the top parking area; otherwise it's about 3/4-mile hike into the site. On a clear day, the views are spectacular in all directions. It is one of the highest sites in this general area.